Special care needs to be taken when cleaning blankets of this material. This guide is about cleaning wool blankets. Most blankets can be machine washed and dried. Check that wools can be washed and dried, some labels may specify dry cleaning. Depending on the construction of the blanket, synthetics and those made of cotton can be washed on a permanent press, knit or delicate cycle. 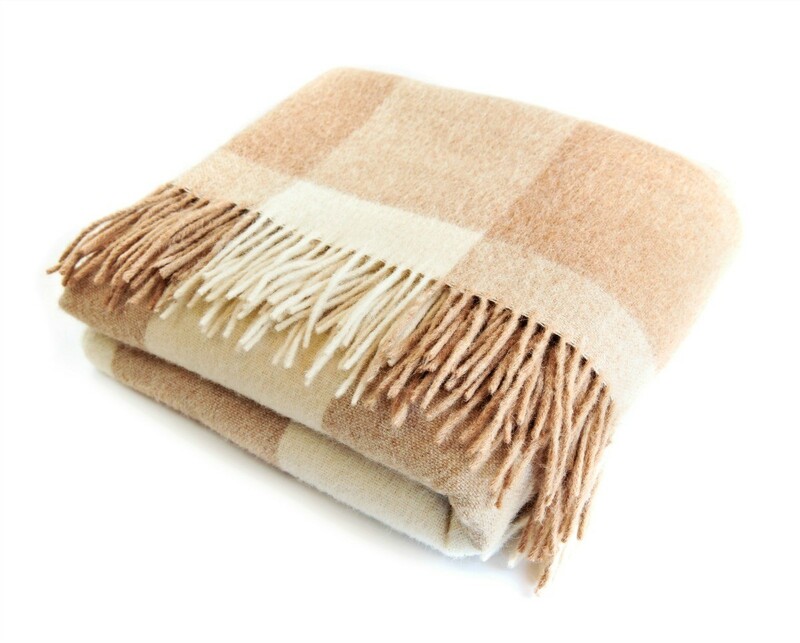 Synthetic blankets and those made of cotton may be dried using the permanent press cycle and temperature. Use highest heat setting if the dryer has no permanent press setting. Dry completely; do not overdry to avoid wrinkling. Remove blanket from dryer as soon as the machine stops. A fabric softener may be used in the washer or dryer to help reduce static cling and make a blanket soft and fluffy. To line dry a blanket, hang it over two parallel lines. Smooth and straighten edges. Change the position and straighten again, when partially dry. Measure a woolen blanket before washing. It should be blocked or stretched to original size after laundering. Pretreat spot and stains. If the binding is heavily soiled, brush it prior to laundering with a liquid detergent or a paste made of detergent granules or soap and water. Or use a prewash soil and stain remover. Wash only one large blanket at a time. Fill the washer with warm or cold water depending on the degree of soil, and a cold water rinse. Add detergent or soap. Agitate briefly to dissolve the product completely. Stop the washer; add the blanket. Distribute it loosely and evenly around the agitator. Soak for 10 to 15 minutes, depending on the amount of soil. Start the washer and advance the control until agitation stops and wash water has been pumped out of the tub. After about a 1 minute spin, slowly advance the timer to the deep rinse cycle. Allow washer to finished the wash cycle automatically. Dry a woolen blanket on the high temperature setting. To absorb moisture and dry a blanket more quickly, place 3 or 4 dry towels in the dryer. Preheat the towels for 3 to 5 minutes. This helps absorb moisture, dry blankets rapidly and avoid pilling caused by long tumbling. Place the blanket in the dryer with the warm towels. Set dryer control for about 20 minutes. Check the blanket after 10 minutes. Remove while still slightly damp to avoid shrinkage. Place blanket on flat surface or over two lines to finish drying. Stretch it to its original shape. When the blanket is completely dry. brush gently to raise nap. press binding with a cool iron, if needed. Tumble drying knitted woolens is not recommended. Instead, trace the outline of the blanket on a clean piece of paper. After washing. block by finger pressing gently to this outline. Let the garment dry to this shape. This article was written by Anne Field, Extension Specialist, Emeritus, with references from the Soap and Detergent Association. Question: Can you put wool blankets in the dryer? Can you put wool blankets in the dryer? 100% wool will shrink if not pre-shrunk already. I wouldn't put them in the dryer. Liz, I wouldn't even try it! I had a wool vest and I washed it and it came out fine, but then I threw it into the dryer and it came out "doll" sized. I would take it to the dry cleaners and have it cleaned professionally. I always wash wool blankets on "delicate" but never put them in the dryer. I hang them on the line and they come out just fine. This will save on dry cleaning. I do the same w/wool clothing. If you have an air fluff setting (no heat) you could toss them in the dryer but any heat will shrink them. IF you launder it in the machine, use gentle cycle & cold water w/ little detergent as blankets tend to over-suds. IF you put it in a dryer use NO HEAT what-so-ever, none, use the air fluff setting only. It will take a long time to air-fluff dry but it won't shrink. Also will help to remove odors & fight stiffness as will pouring a cup or two of white vinegar in with the rinse water. An alternate would be to air- fluff the blanket for a while then hang it over a shower rod to continue drying, or the reverse, hanging to dry then air fluffing to regain some softness so the blanket isn't stiff. Not unless you want a baby blanket! Wool shrinks from agitation. Cotton shrinks from heat. So putting them in a cold versus hot dryer could still shrink it if it's going to shrink (that is, if it's not pre-shrunk wool). Agitation in the washer could cause shrinkage too, so the delicate cycle or hand washing is safer. Sadly no. Wool turns into felt when it's wet, and is like hair when it mats. If there is a square that you could cut off and bind the edges, you could put it in a shadow box and remember it. Can you unravel some of the yarn and make a heart from it, put it and a photo of the intact afghan in a frame? That is what I would do but I hope someone can help further.